Frederick Winslow Taylor has blood on his hands. Once we understand a little more about how ‘Scientific Management’ contributed to great evils that occurred in the first half of the 20th century, a question besides whether or not Taylor has blood on his hands will emerge: Do we? Before going further, we must hasten to state that wisdom dictates that we be careful in how we levy blame. It could be argued that if it hadn’t been Taylor it would have been someone else. Also, there were many, many, contributing persons and factors. It is just this truth, however, that should give us pause. It is possible to contribute to the spirit of the age, in our own small, but meaningful way, only to discover that the spirit in question was, in fact, a demon. Frederick Taylor played more than a bit part in bringing about the horrors of the 20th century. If you are reading this, such an assertion might seem as though it comes from way out of left field. Taylor is known for his influence on attitudes towards management, and this particular work is the distilled presentation of his philosophy. He was an engineer who advocated for management principles based on scientific principles and complained about the ‘rule of thumb’ style that preceded him. What could possibly go wrong with such a message? The philosophy of Frederick Taylor became known as Taylorism. This philosophy resonated well in the zeitgeist of the early 1900s. This was a period of time when there was a great clamor for change all across the world and high hopes everywhere that reform was actually possible. It was a period of time when it seemed possible to re-make society, and Man himself. It was also the period in which the seeds of the Holocaust had already sprouted, and were beginning to bear fruit. It was the period in which the concentration camps of Germany and the gulags of Soviet Russia were already dimly perceived. It was the period in which thousands were being sterilized against their will in the United States. What is the connection to Scientific Management and Frederick Taylor? To see it, we have to dig into that zeitgeist a little bit. In the first place, when Taylor was writing, there was the widely held view that the conclusions of science had prima facie implications on society, and no reasonable person could possibly stand in the way of science. (Is this not still a widely held view?) Leave aside, for the time being, the fact that people had mutually contradictory positions that they thought were derived directly from scientific foundations. They all, nonetheless, believed their reforms were based on cold, hard, logic and science. In the second place, it was vogue to think of society in organic terms, as though it were a ‘collective’ or even a living body. The individual components (what some worldviews would call human beings) were of small consequence when weighed against the ‘common good.’ It is important to understand that it was deemed a conclusion of science to view society in such terms. Note throughout the connecting strand of science. But what does this outlook have to do with the bloodshed of the 20th century? By saying that the individual must give way to the ‘system,’ the spirit Taylor is summoning clearly invokes some kind of moral principle that implies that there is a duty to pursue corporate health over against individual health, and that this duty should be employed scientifically. It is not hard to chart this spirit in Nazi Germany or in communistic systems. In the past, the individual was of paramount importance, but then modern science proved that the individual was of small consequence when compared to the social body, of which the individual was just one cell or micro-organism. In the first place, in regulating duration of life, the advantage to the species, and not to the individual, is alone of any importance. This must be obvious to any one who has once thoroughly thought out the process of natural selection. It is of no importance to the species whether the individual lives longer or shorter, but it is of importance that the individual should be enabled to do its work towards the maintenance of the species. This work of reproduction, or the formation of a sufficient number of new individuals to compensate the species for those which die. As soon as the individual has performed its share in this work of compensation, it ceases to be of any value to the species, it has fulfilled its duty and may die. Whether it is the ‘collective, the ‘social body,’ the ‘species,’ the Volk, ‘society,’ or Taylor’s ‘system,’ the individual has its proper place… well below the social organism, and eminently expendable. The clearest case for how Taylorism wrought calamity can be seen in the rise of communism in Russia. According to the scholar Richard Stites, in his Revolutionary Dreams: Utopian Vision and Experimental Life in the Russian Revolution, the works of Taylor were already well known in Russia prior to the first world war and before the Bolshevik uprising. If you are already familiar with Taylor’s arguments and reasoning, and the widespread acceptance of it among wealthy capitalists, you might have wagered that the Bolsheviks would have seen in Taylorism a bitter foe to be defeated. You would be wrong. According to Stites, “numerous Bolsheviks were attracted by Taylorism’s exaltation of efficiency and organization.” According to Stites, Taylorism permeated the communist para-digm for decades. Stites reports that Lenin embraced Taylorism—they all did. The communists who invoked Taylor insisted that they were doing so “selectively,” avoiding the “exploitative” elements. Stites reports that those on the left “admired the organization, power, and discipline” that Taylorism exuded. Heady stuff, if you think all the other people are the machines, but you imagine yourself as the Manager. An anti-intellectual and a hater of individualism, Taylor analogized the human body to a machine and the industrial to the military order. For him the factory was not only an arena of production and an idyll of elegant precision but also a moral gymnasium for the exercise of good character. The chief virtue of his moral systems was silent obedience. We look at what happened in Germany and in the communist countries and we wonder how it was that the people tolerated it, and here we have a clue. The citizens had been programmed to obey the managers in the name of efficiency, and obey they did. The managers, on the other hand, considered themselves separate from these masses, and in regarding the swarming, churning worker bees below, saw them as cogs, components, replaceable, and, in a word, expendable. It is not hard to see how a society built along such lines could descend into purges and gulags and, literally, tens of millions dead. While the spirit of efficiency, scientific management, and a materialistic reduction of men into machines was also part and parcel of what happened in Germany and the United States, the connection to Taylorism was not as explicit as it was amongst the Soviets. Perhaps it was because Russia was being re-made with labor considerations chiefly in mind that Scientific Management was given public currency. Nonetheless, there was a connection between Taylorism and what occurred in the West. Rather than delve into the particulars of the Nazi’s defense at Nuremberg, why not hear a full confession by an American that they were in fact intent on doing in the United States what the Nazis were doing in Germany? The superintendent of Virginia’s Western State Hospital, Joseph Dejarnette complained, in 1934, “The Germans are beating us at our own game.” That ‘game’ revolved around compulsory sterilization, anti-miscegenation laws, and so on. Dejarnette was complaining, because—alas for him and other American eugenicists—democracy was proving a hindrance to their objectives and aims. Those who might wish to suggest that no Americans could have tolerated the wholesale destruction of millions of people in the name of a eugenics program clearly have not read the writings of these early eugenicists for themselves. In Germany, the power of the state was under the tight, dictatorial control of a powerful tyrant, but in America, the eugenicists were forced to work within a system hampered by ‘the will of the people’ and ‘checks and balances.’ To say that they were envious of the Nazi’s ability to implement eugenic policies is to put it mildly. After all, American eugenicists had been talking about ‘segregation camps’ for decades before the Nazis actually built one. Taylor is not usually cited in studies of American and European eugenics. His contribution was not direct, but indirect. Eugenics and Scientific Management are siblings in a family of ideas that have as their parents the father, Authoritarianism, and mother, the Collective. In this family, discipline is administered scientifically, unhampered by sentimentality. One searches in vain for direct contributions by Taylor to the eugenics movement, but if you turn your attention to men like Andrew Carnegie and John Rockefeller and their respective foundations, one discovers their influence in pushing explicitly eugenic agendas under every rock you turn over. And oh, by the way, they were huge advocates of ‘scientific management’ and ‘efficiency.’ There is your connection in a nutshell: the very same men who wished to prevent race suicide and backed it up with lots of cold hard cash were the same ones who insisted on the sober application of scientific principles in an efficient manner. Carnegie, Rockefeller, and other industrial tycoons spread their money around liberally—in the United States and Germany—as they sought to re-make society. Eugenics was one core venture, efficiency was another. Of course, their money only had an effect because there were ‘true believers’ to take it. In Taylorism terms, you can rest assured, they did not see themselves as one of the teeming masses, but rather one of Taylor’s scientific managers. Taylorism and its efficiency craze spread across [the United States], becoming in the words of a contemporary “a normal American madness.” Part of its appeal was the homespun ethical message it preached. Harrison Emerson, a Taylorist engineer, spoke of the five great moralities—righteousness, hygiene, education, industrial competence, and adaptation; … In a climate of moralism, authoritarianism, reform, science, and mastery, Americans began organizing themselves into efficient modules: clubs, societies, and campaigns showed how Taylorism could be applied to the home, the school, the university, the army, the government, and the library. Note how the Taylorist Emerson included ‘hygiene’ as one of the ‘great moralities.’ During this period of time, this word was thoroughly imbued with eugenic meaning. Perhaps if one looks at the two words very closely, hygiene and eugenics, one may be able to detect the relationship. Almost everywhere one looked during this period, people saw themselves engaged in a great building project—the building of the Perfect Society. Efficiency, eugenics, education, government… no aspect of society was seen as off limits by the world’s social engineers. What they all had in common was their view that Society trumped the individual and every effort should be conducted scientifically. Eugenics, immigration reform, education reform, government reform, industrial reform, the military—yes, they were all part and parcel of a worldview that saw the individual as secondary and expendable, and the system as of foremost concern. The individual dies and goes away, but the well-managed system lives forever. If one knows the rules and laws of the system and acts accordingly, that system will be well-managed. Isn’t that what scientific management is all about? Unfortunately, even a ‘system’ composed of persons is still not a person. It is an artificial construct, a metaphor. It does not exist except within the minds of the individuals who are a part of that system. We may compare it to a body, but it isn’t a body. We might find similarities with machines, but it is not a machine. Two things follow. First of all, just because there is a network of relations that emerges naturally when people are together which we describe through metaphors, it doesn’t follow that any metaphor we choose to apply really describes what is going on. Second of all, because people are people, when they come together, we do observe certain common themes that emerge naturally. To put it bluntly, a ‘system’ composed of humans is not infinitely malleable. At some point—usually very early on—its inhuman elements become evident. Not long after this, we tend to see stacks of dead bodies. Efficiency may be something that we look for out of a machine, but since humans are not machines, compelling them to be maximally efficient really has the effect of driving their humanity out of them. When we consider the fact that all humans are inefficient by their very nature, the brutality of the operation required to make them efficient is not hard to anticipate. ‘Scientific Management’ and Efficiency were not Taylor’s invention or proprietary product. There were many others, inside the United States, and outside, that were peddling both. We cannot lay everything at his feet. Certainly, since Taylor died in 1915, before the Nazis even existed or the Bolsheviks had done their worst, we cannot assign to him direct culpability. What it speaks, too, however, is the power of words and ideas and hence the responsibility of those throwing them around to weigh carefully their possible consequences. 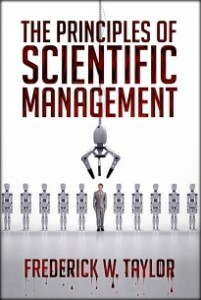 If you read read Taylor’s book on ‘Scientific Management’ there no doubt will be some features of it that strike you as odd sounding and awkward. Certainly, he says some things that people wouldn’t dream of saying today. By and large, however, you will emerge thinking that there wasn’t that much offensive, and certainly not dangerous. Some of it you will even think is self-evident, valuable, and useful. We begin to draw close to the warning of the opening sentences of this essay. Taylor’s viewpoint is dangerous, just as any viewpoint that refuses to accept humanity as it really is, and instead insists on molding it into something else. Add to that the common sentiment that we have a moral duty to mold humanity into something better, for the common good, or stand idly by in ‘silent obedience’ while ‘expert’ social engineers do their work, and we have a recipe for disaster. Very few in the period between 1900 and 1915 thought that anything being then bandied about could devolve into a cataclysm resulting in hundreds of millions dead before the century let out. The world, collectively, was surprised. Everyone had the purest of intentions. Today, many of the same arguments are being made, and with the same passion. Other arguments, equally dehumanizing, have wide currency. A cursory look at the last century should tell us that we cannot play with ideas as a child plays with a toy. Ideas have consequences; ideas can kill—by the millions. The chief argument of that time that still is common today is that the individual is of far less importance than the state, that liberties can be stripped away for the ‘common good.’ Today, as in years past, there is widespread attempts to turn humans into something they are not, viewing them in much the same way that they were viewed at the beginning of the 20th century. Nothing good can come of that. Quoted by V. L. Komarov in Marxism and Modern Thought, p. 193. See for example Richard Weikart’s From Darwin to Hitler: Evolutionary Ethics, Eugenics, and Racism in Germany. August Weismann, Essays Upon Heredity and Kindred Biological Problems (London: Oxford at the Clarendon Press, 1889), 9-10. As quoted by Stephan Chorover in From Genesis to Genocide: The Meaning of Human Nature and the Power of Behavior Control (Massachusetts: The MIT Press, 1979), 100. Emphasis in the original. Richard Stites, Revolutionary Dreams: Utopian Vision and Experimental Life in the Russian Revolution (Oxford: Oxford University Press, 1989), 147. See pages 259-260 of Edwin Black’s War Against the Weak: Eugenics and America’s Campaign to Create a Master Race (Washington D.C.: Dialog Press, 2012). As quoted by Edwin Black, 277. See page 73 in Chorover’s book. Another person who had much to say about the connections between eugenics, compulsory education, and ‘system building’ promoted by wealthy early 20th century industrialists is John Taylor Gatto in his The Underground History of American Education. Gatto also has much to say about Frederick Taylor and ‘Taylorism’ and even eugenics, although his focus is America’s public school system and compulsory education, not eugenics. See pages 171-177 in particular.